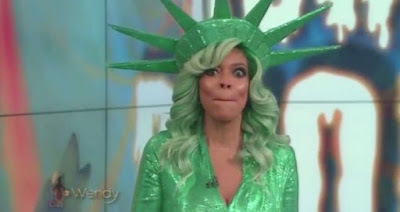 Wendy Williams sent viewers into a panic today when she collapsed on live TV. 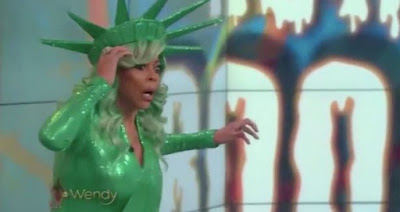 The US presenting star was dressed as the Statue of Liberty for a special Halloween broadcast of her show, Wendy, when she fainted. As her show returned from a break, Wendy began introducing the next segment from her spot behind a podium. "Welcome back," she said. "It's time for our Halloween costume contest, we do it every year, it's always a lot of fun, let's get started." Wendy's voice then breaks a little as she continues talking, and a terrified look suddenly comes over her face. It's clear that she's struggling and isn't feeling well. The presenter clearly suffers from a dizzy spell as she stumbles backwards and tries to grab onto the podium to save herself from falling. But poor Wendy suddenly falls to the ground and crew members rush to her side to help her. Wendy's show was going out live on the East Coast of America, so when it happened, producers quickly cut to black then to a commercial. When the show returned, Wendy explained that she'd overheated in her costume.